From the in the car, in the rain photo shoot 2 or 3 days ago. I used it yesterday as part of my sad-for-myself/art post, and never even talked about it. 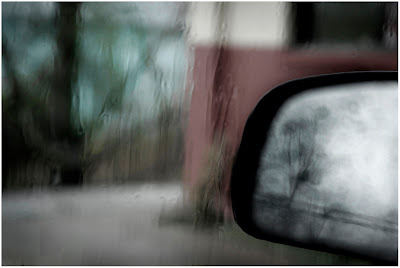 Never said a word about how much I fell in love with those hazy, rainy, skeleton trees in the sideview mirror, the only shot where the trees appeared; it's all raindrops in the other images. It's that moment I strive to paint, so still, but a deceptive stillness, there's movement all around, I sense it, but those trees seem part of a different landscape, quite ghostlike, removed from the rain. I continue to work on bringing my painting aesthetic into my photos; the less I worry about it, the easier it becomes, or perhaps I've just grown more comfortable with the camera. Whatever the reason, however I am getting there, I am getting there. There's a whole subset of photos that I didn't realize I loved taking and that's inadvertent reflections (windows, random mirrors, chrome). This is a truly fine example. I love the trees. It was the first thing I noticed. what is it about the trees .. they mesmerize me! Your photos always have such a painterly quality. This one more than most. You find the magic in the most wonderful of ordinary. Getting there? You have always been there. Since I have known you...finding the beautiful in the ordinary..making the details of your life look like a painting. Not only the trees in the mirror, but the one in the background as well. Beautiful colour wash. Like a painting.